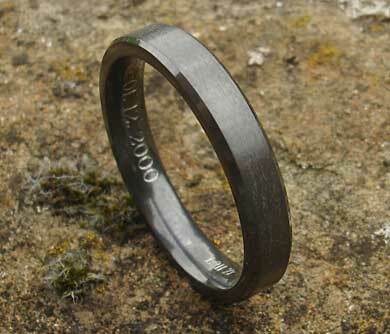 Men's Unusual Black Wedding Ring : LOVE2HAVE in the UK! 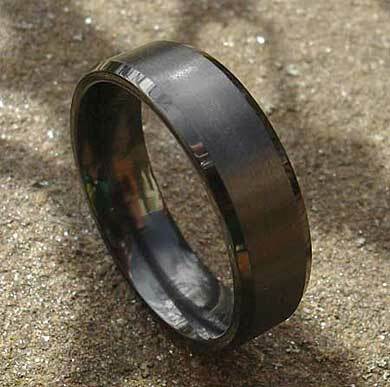 A 7mm width flat profile men's wedding ring in black zirconium with bevelled edges that is available in both a polished or a satin finish. Here we have the satin version pictured depicting the unique bevelled edges that catch the light very nicely. 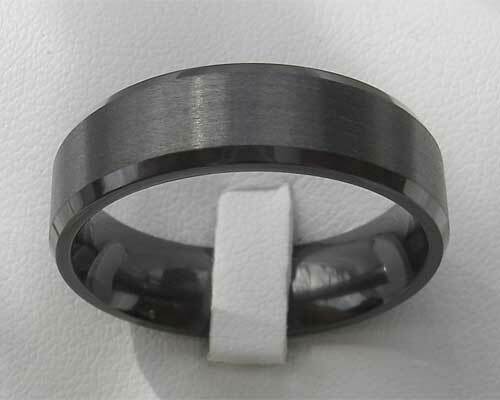 While we have listed this ring in the men's section, women considering this style of wedding ring will be interested to know that it is available in thinner widths also. Please contact us regarding this option, and we can advise further. All black zirconium rings are UK made using specialist heating ovens, and we sometimes get asked about zirconia which is also black. However, this is not the same and is in fact quite brittle which zirconium is not. Zirconium is by far the better choice.